The quintessential scooter in India is defined by its ability to haul two humans and their luggage in relative ease when compared to a motorcycle. Scooters have always been synonymous with the word convenience. However, there is a niche out there that desires a little more performance, handling and some fun from the automatic scooter. This is the domain of 125cc scooters. The previous Suzuki Access has been our favourite scooter in this niche and packs quite a punch. 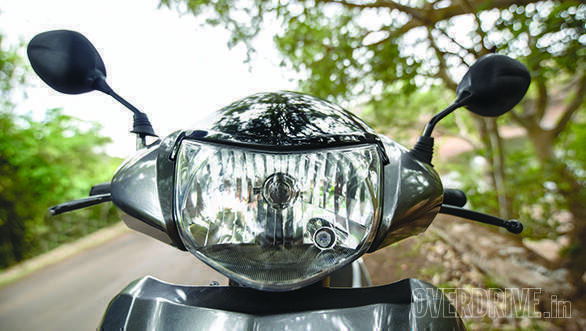 But with the arrival of the Honda Activa 125 and the Mahindra Gusto 125, the Access had started to feel a bit long in the tooth. Then Suzuki launched the new Access 125 which we tested in the May issue. This made us curious about how it'll fare in the face of competition. Can it pose a challenge again? 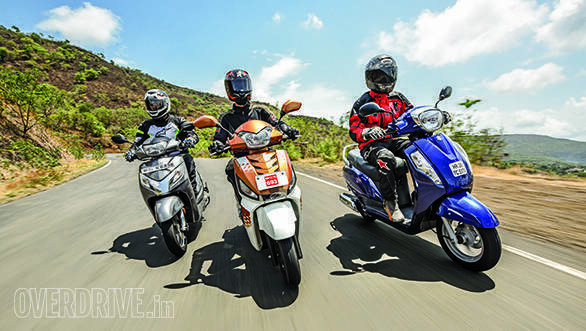 The Honda Activa 125 has been around for the longest time amongst these trio, but to the credit of the Honda design team, the Activa still looks fresh. The front apron with the chrome garnish that merges into the large indicators gives it a neat, distinct look. However, the side panels and the large tail lamp are quite a basic design that's typical of your average scooter. It's almost as if the designers lost interest halfway through the design phase and decided to stick to convention. 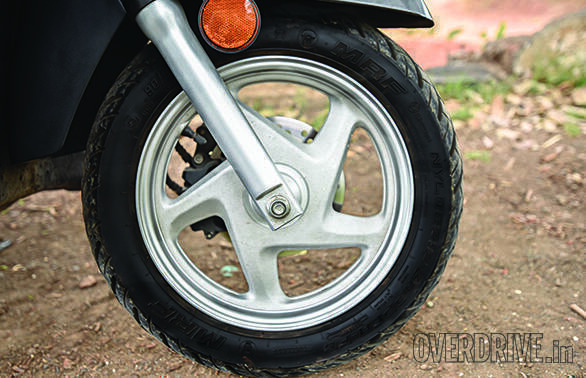 The Mahindra Gusto 125, on flipside, is the one trying to break convention here. Its panels are mostly flat and squared off, especially true for the front mudguard and side panels. The rear is easily the most distinctive amongst the current crop of scooters, and I quite like the way the tail lamp is shaped. It's reminiscent of tail lamps on Aston Martins. That said, the loud metallic orange paint scheme that blends into the base white, and the stickering makes it look quite gaudy. It's like the college teen who's trying too hard to get some attention. The chrome strips and bar-end weights do not help matters either. I'd personally prefer the Gusto in the DX trim that gets the single paint shade sans stickers. But if you opt for the DX, you will lose the black finish on the wheels and the forks. Also, the build quality needs more attention. 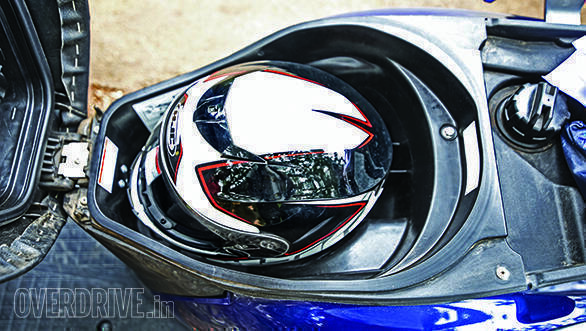 The plastic panels, for instance, have rough edges, and the pillion foot rest has a bit of play and feels flimsy. The Suzuki Access 125 then has the right mix of style and elegance. 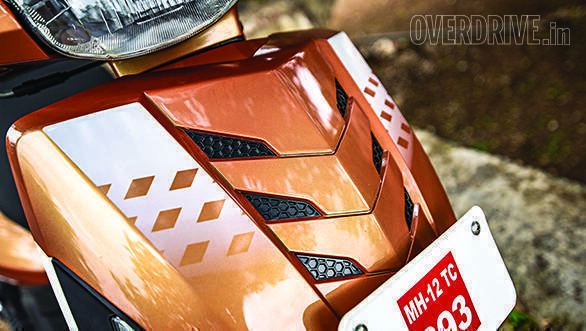 The Access' styling, while lacking in embellishments like stickers, is the one that will stand out from the crowd. It isn't a plain Jane design like the Activa or out of the world like the Gusto. It chooses a balance, but within that balance, it stands out from the crowd elegantly. The large position lamps and indicators on the front apron are just the right size, whereas the tail lamp completes the profile, lending the Access with a proportionate look. The build quality, sadly, is not in the same league of other Suzukis in the market. The paint quality is not up to the mark, and we spotted an orange peel like texture on the paint surface, particularly on the front panel. The black plastics around the instrument panel and behind the front apron had begun to fade and acquired a greyish colour. I really didn't expect this, especially when you look at the test Honda's plastics and paint finish that have stood the test of time. The Access has the roomiest seat and floorboard, which means riders of varying heights can sit comfortably. The high handlebar also ensures that the bars don't foul with the legs, even if you are as tall as Rishaad. The Activa's seat is equally firm and supportive, but the floor board area is relatively cramped. The Gusto's seat is way too soft and you feel the discomfort within 20km of the journey. This was confirmed by Rishaad too, and I wish the Gusto's seat had the firmness of the Access' and Honda's seat. The floorboard area is adequate and riding position is comfortable. 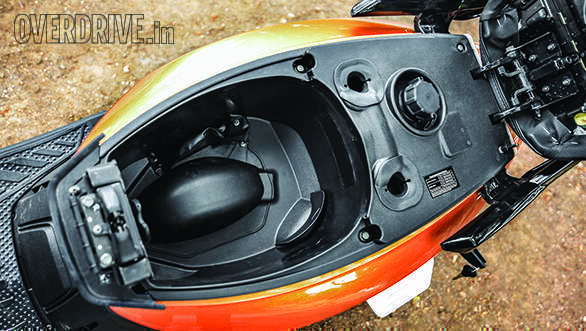 The Mahindra Gusto 125 is the most feature-loaded scooter with the height adjustable seat (ranging from 735mm to 770mm) being the most useful/thoughtful in my book. The remote flip key with buttons to activate the "find me" lamps - the turn indicators blink with a beep to help locate the scooter in a crowded parking lot, and the "follow me" home lamps are quite nifty too. They might be a tad gimmicky, but you cannot deny the convenience of a beeping scooter in a crowded parking lot. The Suzuki Access 125 also gets some useful features such as a bottle holder, 3V charging socket (optional) and a large storage bin that can accommodate a full-face race helmet. 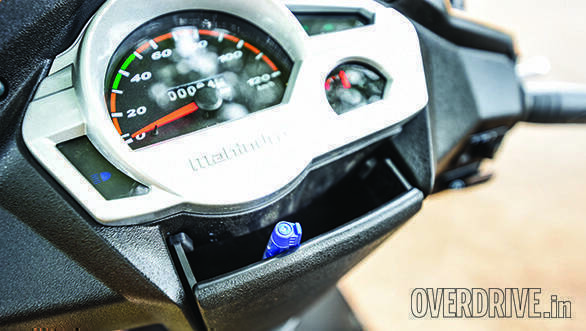 The ignition hole has a shutter to keep thieves at bay (also available in the Activa). The instrument cluster has a digital display for fuel, two trip meters and an oil-change indicator. 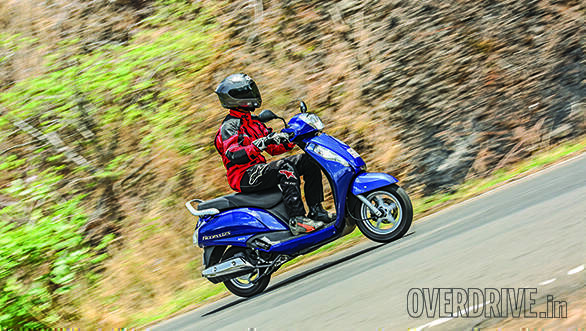 The Honda Activa 125 is the least feature packed, and that has a lot to do with its age. When it was launched a couple of years ago, it had a digital trip and odometer as well as a digital fuel gauge, fantastic for that time. But it's 2016 now and the game has moved forward. Honda needs to really think about what it will do to the Activa 125 now. The Suzuki Access has the best motor in the category, period. The 124cc single-cylinder engine is its hallmark, and Suzuki has done a stellar job of tuning it to deliver the power with a sense of urgency that's quite fun to be honest. The motor produces 8.7PS at 7,000rpm and 10.20 Nm at 5,000rpm. 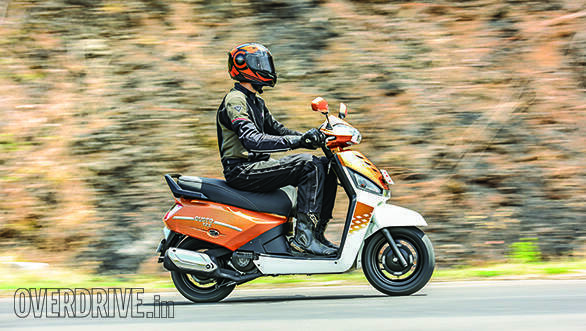 This translates to a peppy acceleration, and the Access feels faster and livelier than the Activa and Gusto. The 0-60kmph is dispatched in 7.9 seconds, and we've recorded a true top speed of 93.4kmph. What's amazing is that even at those speeds the motor feels unstressed. Considering the low kerb weight of 102kg, it's no surprise that the Access 125 is the fastest scooter here. 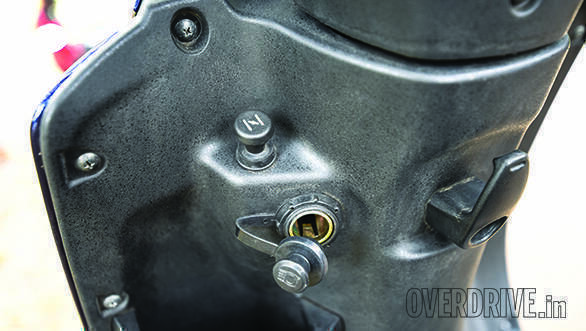 The Honda Activa's 124.9cc engine develops 0.2PS more than the Access' motor, but at a higher 6,500rpm. It's the second quickest to 60kmph (8.9 seconds) and records a top speed of 89kmph. Engine refinement is good, but it diminishes as the speed rises. 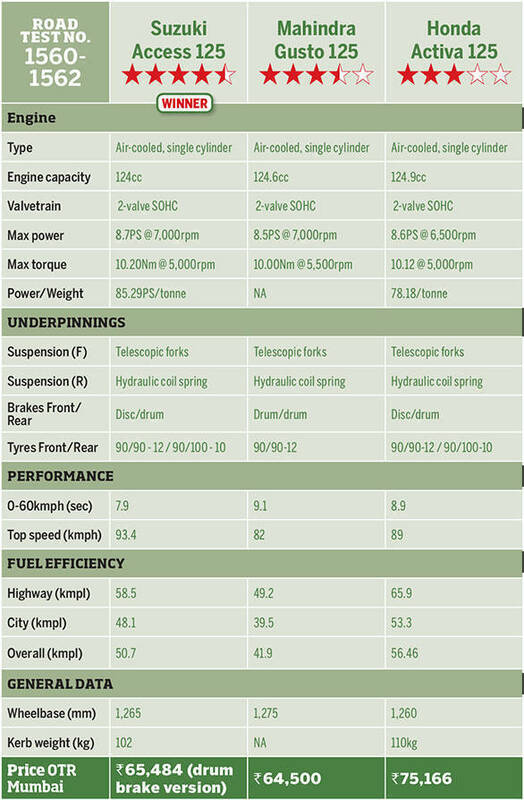 The Mahindra Gusto's 124.6cc engine took me by surprise. It has to be one of the smoothest engines in the market. There are next to no vibrations, no matter what the speed, and the bar-end weights do a good job of ironing out any vibes that may creep in. It may seem that I'm floored by the motor, but I was unimpressed with the engine's power delivery. It produces 8.5PS at 7,000rpm and 10Nm at 5,500rpm, making it the slowest on paper. 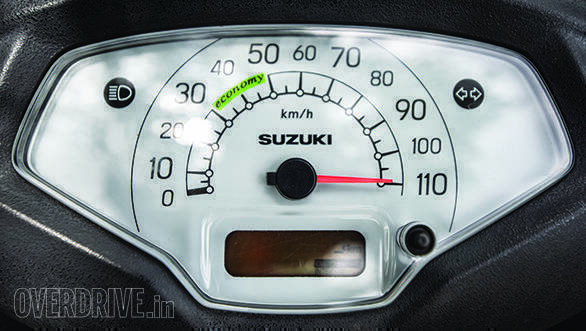 In the real world too, the Gusto does not feel as zippy as a 125 should, clocking 9.1 seconds on the 0-60kmph run. The motor also struggles to gather pace on an incline. This is evident when you try to overtake slower traffic on a flyover. On smooth tarmac, there's little to separate the three scooters here. However, when the bumps show up, it's a different story. The Suzuki Access 125 has the best ride and handling set-up, and that makes it a very involving scooter to ride. We rode across broken tarmac and through large craters, but the suspension handled the punishment with aplomb. The telescopic forks do a terrific job of isolating the jolts from the rider's arms, and the rear shock does the same for the lower back. The firmness in the suspension also translates into incredible handling around corners. Coupled with the grippy MRF rubber and the sweet chassis, the Access can carry a lot more corner speed than you can imagine on any scooter. The sure-footedness is felt instantly as you tip it into corners, and it's simply the most fun in the bends. The disc brake is powerful and offers progressive feedback. The Access is also the most well-behaved under hard stops, never stepping out of line. It'd certainly be a reassuring feeling if I encounter a hairy situation on this scooter. 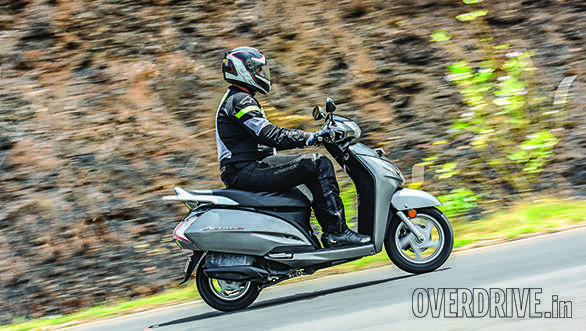 The Honda Activa 125 is the polar opposite of the Access 125 when you consider ride quality. Over the same section, the Honda is unhappy and protests with loud thuds from the front and rear suspension. You feel every bit of the rough surface, through the arms and back, and the stiffness in the suspension makes it a pain to ride on bad roads. But we're willing to cut the Honda some slack, considering the test scooter we had was a bit worse for wear. The handling is decent and it feels agile around the bends. It's tip happy too and quick to change direction as long as the roads are not bumpy. 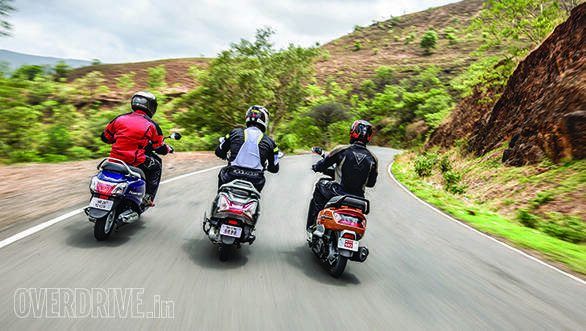 The brakes offer good bite and feedback, but the Activa lacks the composure of the Access under hard braking. It's not unnerving, but in comparison, the Access is better. The Mahindra Gusto 125 offers great ride quality which slots in between the Access and Activa. It soaks up the bumps with ease, and you don't mind trashing the scooter over the rough stuff. The handling is pretty decent, but it could do with a little more balance around corners. It is the only scooter here without a front disc brake, but the 130mm drums do a pretty good job of hauling down speeds. The aluminium levers feel chunky, and I quite like the feel they offer. That said, there's no comparison to a disc brake-equipped scooter. 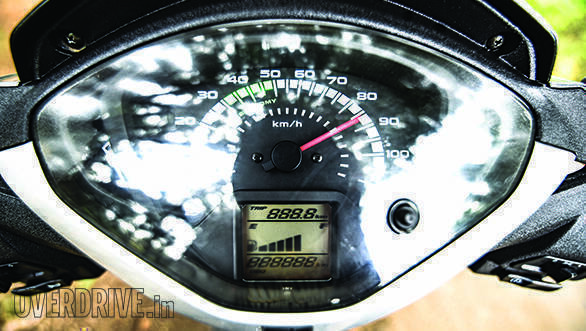 The Honda Activa 125 is a well-built, no fuss vehicle that will go about serving you on your daily commutes, albeit a little faster than your regular scooter. But it isn't fun to ride, especially when you consider our bumpy roads. Also, when you consider the high asking price, at Rs 75,166 (on-road, Mumbai) for the disc brake and alloy wheel equipped DLX variant, which you see here, it's seems like too much money for a scooter that's not as fun and feature rich as others. The Mahindra Gusto 125 presents a strong case for itself. It is packed with features and has an incredibly refined engine, and the ride is compliant with our road conditions. It may lose out on outright acceleration and performance (0.2 seconds slower than the Activa 125), but it's not a deal-breaker. At Rs 64,500 (on-road for the VX variant), it's the most affordable of the lot, thanks to the lack of a disc brake or alloy wheels. Also, the DX variant, which loses the height adjustable seat (stays at 770mm), remote flip key, find-me and follow-me home lamps, is cheaper (Rs 60,000, on-road Mumbai) by Rs 4,500. Now that's good value if you consider the price of the highest selling 110cc scooter, the Activa 3G (Rs 59,179, on-road Mumbai). But in this test, it will have to settle for second place. The Suzuki Access, then, is the undisputed champion of this 125cc scooter battle. It looks contemporary. It rides and handles unlike any other scooter, and the engine with its performance injects a dose of fun to a regular commute. The price is quite fetching too. 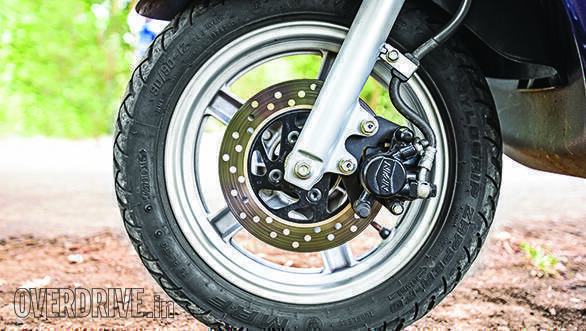 The steel wheel, drum brake-equipped variant is priced at Rs 65,484 (on-road, Mumbai), while the disc brake, alloy wheel variant should be dearer by a few thousands rupees only. I'd strongly recommend you to put in the extra cash. It's definitely worth it.